This is the result of what I have been doing just about every day since the flood. When cookbooks came in, donated by friends, family, loyal readers, and perfect strangers who I now call friends, they were first piled into my dining room and living room, and sometimes when I literally couldn’t keep up, into the kitchen and family room. Next, I had to separate each box, making sure I didn’t mix any up, file them into banker boxes, then write each person’s information, title and author of each and every book onto a Word Document. I keep every card and note people include because those are so special and will always remain in the book. At last count there were well over 500 cookbooks, and they continue to come every week. The generosity of people is beyond anything. Every time I write a blog about someone’s books, I put a check mark next to their name on the box. I am going in no particular order. I am having the best time and so honored to be writing about everyone. It’s going to take me a while to write them all, but I will get there! 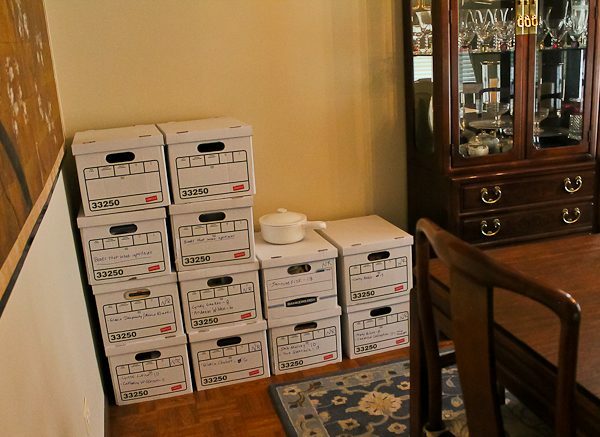 That was one corner of my living room, and here’s a few more in my dining room. There are also more by my computer that I am working on at the moment. Notice my beautiful French dish on the top of the box. It survived. Don’t know how, but it did. It’s my favorite dish to make the Pillsbury Bake-Off winner from way back, Dilly Casserole Bread. It’s the perfect size. 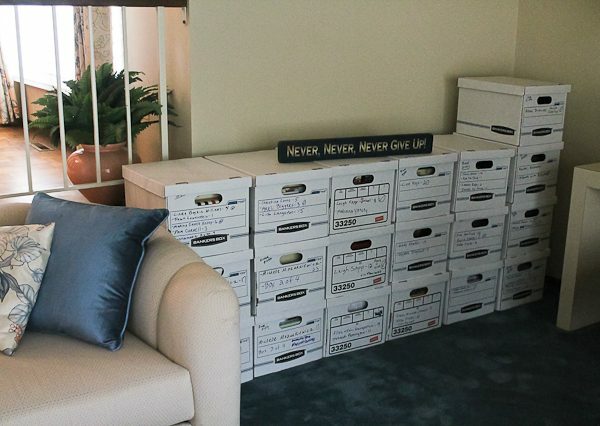 If you notice the sign on top of the boxes in the living room, it was something that kept me going when I didn’t think I could. I carried it around with me and set it down where I could see it. That sign always reminded me of how lucky I was to have so many people who cared enough to send books and words of love and encouragement. I continue to thank you all from the bottom of my heart. This all happened before the Texas hurricane tragedy. I only lost a basement, people there lost entire homes and neighborhoods, and worst of all, loved ones. I watch the news every day and pray for them every day. The good people of Texas who are suffering are receiving help from all over the country and are discovering how incredibly generous and wonderful Americans are, and always help other Americans in time of need. I hope they all find the courage to keep going and know we all care for them. 4 Responses to All the Lovely Boxes! Thank you for sharing your news! It’s great to hear that you’ve been able to get your cookbook supply reestablished again! I LOVE cookbooks, too, but now that I live in an apartment, I admit that I’ve narrowed down various books and yet I still manage to find more recipe books (mainly from Taste of Home)! Thank you for this latest comment from you! OH my, I am so impressed with your never give up slogan!. Your organizational skills are 2nd to none. We all circle the wagons when tragedy strikes. You are such an inspiration. Keep smilin’ and writing to let us know how things are going.